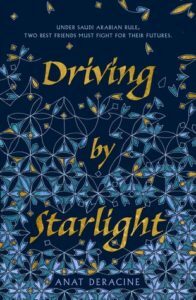 This book is about teenage girls coming of age in Saudi Arabia where women are restricted in so many activities that American women take for granted. The two main characters, Leena and Mishie, are trying to push back against their restrictive culture by listening to forbidden music and by wearing western clothing. They are worried about arranged marriages that will be forced upon them. They have dreams of college that will likely not be fulfilled. They realize that their culture restricts their choice and freedom. This is a good book for any reader that wants a look into a world that is very different from what most of us experience.